“That’s certainly the case for OldSmoothie,” said BusyBody. “So what have they been up to today?” asked TheVamp. “I overheard one chastising another for not tying the pink ribbon around his brief in the correct way,” said TheBusker. “I didn’t even know there was a correct way,” said TheCreep looking a little concerned that he might have missed such an important detail. “Ah, you under-estimate the creativity which exists in the world of pupil paranoia,” said TheVamp. “Anyway, the pupil was pretty much telling her friend that if she didn’t tie her briefs up properly she’d end up playing for Accrington Stanley,” said The Busker. “I can think of a few chambers that match that description,” said BusyBody. “All in a manner which suggested that she was passing on some huge state secret,” said TheBusker. “And leaving the ribbon hanging out of their pockets when they go down the pub,” said BusyBody. 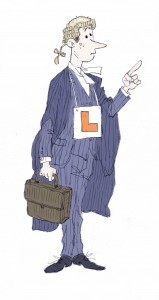 “As if this somehow screams ‘Look at me, I’m a barrister, don’t you know. A real0life, living, breathing barrister,'” said TheVamp. “When no-one other than fellow barristers would even realise what it was,” added BusyBody. “It’s funny. They walk around for that first month deluding themselves that they’re like some kind of legal rock star,” said TheVamp. “Oh, I think that might be to overstate your own career trajectory, wouldn’t you say?” said UpTights.